Vastu, or Sthapatya Veda, is an ancient tradition of architecture, which establishes a relationship between the building and cosmic order so as to have a nourishing influence on the occupants. There are strict rules regarding site location, orientation to cardinal points, room layout and proportions, and the use of natural and nontoxic materials. 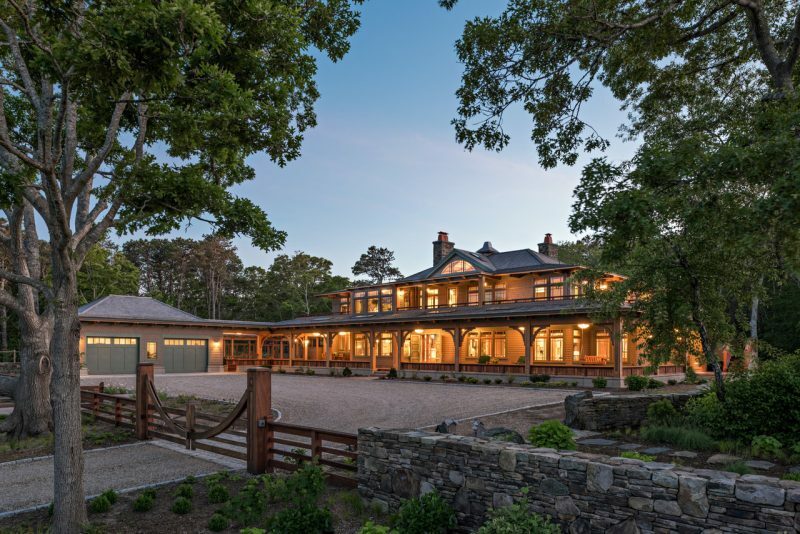 This vastu home was designed and built through a collaborative process between the owners, the architect, Joy Cuming, and her firm Aline Architecture Inc., the builder, Cregg Sweeney and his team of artisan builders and craftsman from Cregg Sweeney, LLC, and the landscape designer, Betsy Furtney, principal of Landline Design, and her crew. Throughout the course of the project, Joy Cuming was coached on the principles of vastu by Jon Lipman AIA, a vastu-certified architect working with Maharishi Vastu® Architecture, an international organization. 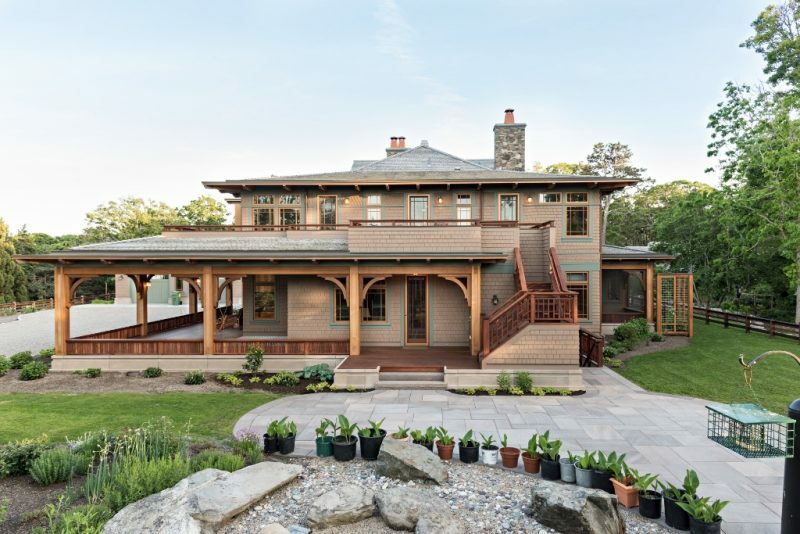 After finding a perfectly sited 2.68-acre piece of land on Little Pleasant Bay, in Orleans, MA, design began on a vastu home that incorporates the owners’ needs while also responding to the Cape Cod vernacular with respect to building materials, architectural style, local zoning and environmental regulatory restrictions. In building the vastu home, the builder was required to uphold an exceptional degree of precision for overall dimensions and specific cardinal dimensions. This degree of precision and fineness was passed on from the foundation to the frame and on to each successive trade. Drawing from the Zen-like qualities of an Arts and Crafts style home, the building achieves its low relationship to the rolling site through the utilization of horizontal lines expressed by the wrapping of the main two-story house with wide open verandas and incorporating large overhanging rooflines, horizontal banding with decorative shingling and trim, and broad bands of casement windows. Stone walls and horizontally formatted fences and gates surround the building complex and define the manicured gardens from the more natural landscape, and meet requirements of the vastu program for a rectangular enclosure in the form of a wall or fence at very specific dimensions from each side of the building. This in turn determined the building’s location relative to the coastal bank of Little Pleasant Bay and other parts of the site. In plan, the strict adherence to the vastu program and the flowing openness typical of an Arts and Crafts style home resulted in a formal design that is zoned per function, and carefully arranged around the central hall, or “Brahmasthan”. In this instance, the central space makes reference to an external courtyard with clerestory lighting, a stone floor, an impressive staircase, balconies, internal windows, the etched glass doors of the entry, and three monumental concrete panels – one with a glass mosaic of lilies, another with a niche for Guatemalan sculpture, and the last an archway leading into the living room. The owners stressed the desire for a cohesiveness of décor and simplicity of style inside of the home, as well as the exterior appearance and setting. 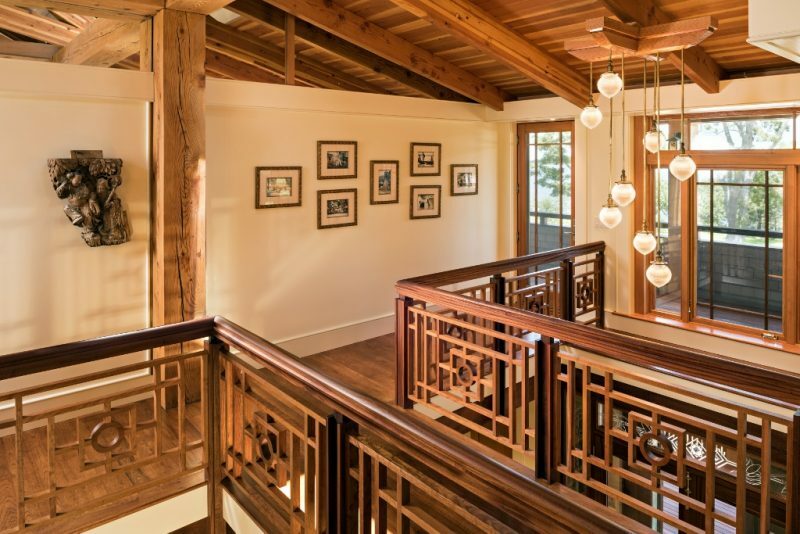 And as the Arts and Crafts Movement was concerned with spiritual connectivity with one’s surroundings – both natural and manmade – it made sense that this style home would complement the vastu program. The formality of the plan gives way to feelings of openness and interpenetrating space in part because of two main circulation spines, north-south and east-west, which intersect in the center of the Brahmasthan and divide the house into quadrants. These circulation spines, termed “axes of light,” must remain unimpeded except by moveable doors or windows and give clarity to the interior layout. A greenhouse and working gardens allow the owner to grow much of their own organic food. Cooking and sharing exotic meals from many cultures of the world is very important to the owners and their family. Consequently, the kitchen and ancillary spaces were very carefully planned. The greenhouse is connected to the house on the south side, with a separate herb pantry and root cellar within the house. The desire for an open fire bread oven was incorporated into the design. The “family nook” is a gathering space within the kitchen, including a bump out with a banquette designed around a large custom made table. The owners commissioned artists locally and internationally to create art pieces, custom tiles, sculpture and furniture that were custom designed for the house. Additionally, the house was designed to accommodate a cherished collection of art pieces, furniture, rugs and precious objects from their previous home. Vastu starts with an understanding of the way in which the sun moves around the earth and the impact that its energy has on the earth at different times of the day. The sun’s energy is believed to be most nourishing when it is rising and therefore has the most beneficial impacts on the building’s inhabitants if the building is oriented to face due east. A vastu is believed to have being. It is aligned to the cardinal points and communicates with the cosmos. The center of the house, or Brahmasthan, is the center being of the house. It is this sacred space that connects the house and those who live there with the cosmos. In laying out a vastu floor plan, there’s a symbolic diagram with Brahma, the Hindu God of Creation, in the center of a square surrounded by nine deities who protect Brahma. The diagram or template is used as a basis upon which the right placement of rooms is determined. The sun has changing qualities of energy as it moves across the sky and thus the activities that the inhabitant of a Vastu building is involved with during the day should be aligned with the appropriate energetic emissions of the sun. Additionally, proportion of the spaces and the overall dimensions of the building both horizontally and vertically are critical to the successful integration of a vastu building in nature. Correct proportions allow the vastu building to act as microcosm of a larger cosmic order – for the individual intelligence to be aligned with the cosmic intelligence. Another aspect of vastu architecture is the selection and use of natural, nontoxic building materials and interior finishes that are harmonious with the environment. The Vastu building program has very specific guidelines as to where electrical and other services enter the house and all electromagnetic fields must be shielded from the inhabitants using MC armored cable and shielded cable. Other critical considerations are the slope of the land, the influences of the immediate environment including water bodies (large water bodies to the east), height and location of surrounding trees, electromagnetic fields (considered inauspicious) and cemeteries (considered inauspicious), auspicious timing as it relates to the cosmos, the astrology of the inhabitants and the dates associated with ground breaking, laying the cornerstone and the final ceremony, or Mahurta, which marks the day when the inhabitants begin to inhabit the completed building. “I had the opportunity to live in a vastu in Fairfield Iowa. There is definitely something about living in a structure that is aligned with the cosmos. I found it very grounding. I slept better, felt more oriented, my creative juices flowed more easily, and I had more success in my life with less effort. I am finding the same thing living in this incredible vastu on Cape Cod. “I love the openness and the internal light that comes from the avenues of lights and the clerestories. I love living in a space constructed with all natural materials, things of the Earth, living in a space that uses geothermal for my heat and considers such things as the effects of electromagnetic smog. I love being enclosed by the walls and fences in our yard. Again it makes me feel grounded and protected.